I am working on the Amhara, Tigray, Oromo and Tigre links too, but it is slow as their real histories are neglected. I am confident that “Egypt” and “Pharaoh” mentioned in the current forged Old Testament are actually the land and the ruler of what is today called Amhara Region. The presence of Beta Israel in Gondar in northern Ethiopia is a very useful starting point to explain events leading to the Exodus of 1446 BC. 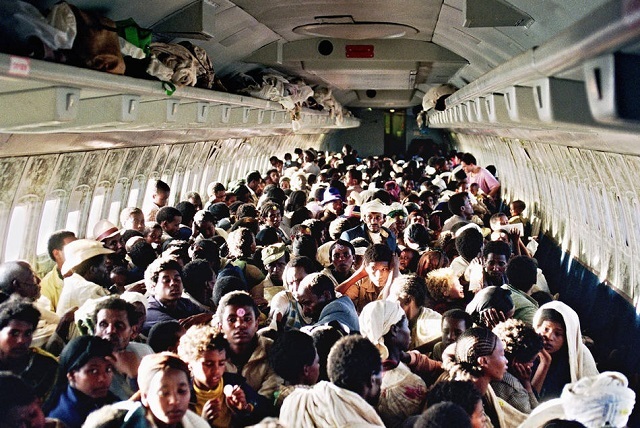 That Exodus certainly took place between Gondar and the Simien Mountains where Moses received the Ten Commandments and the original Torah. Israelite were directed to settle in the Afar Triangle. There must be gold and precious stones mines in that region which made the wealth of Solomon. A queen from the land of Tigray, which later on became Axum, must be Queen Sheba. 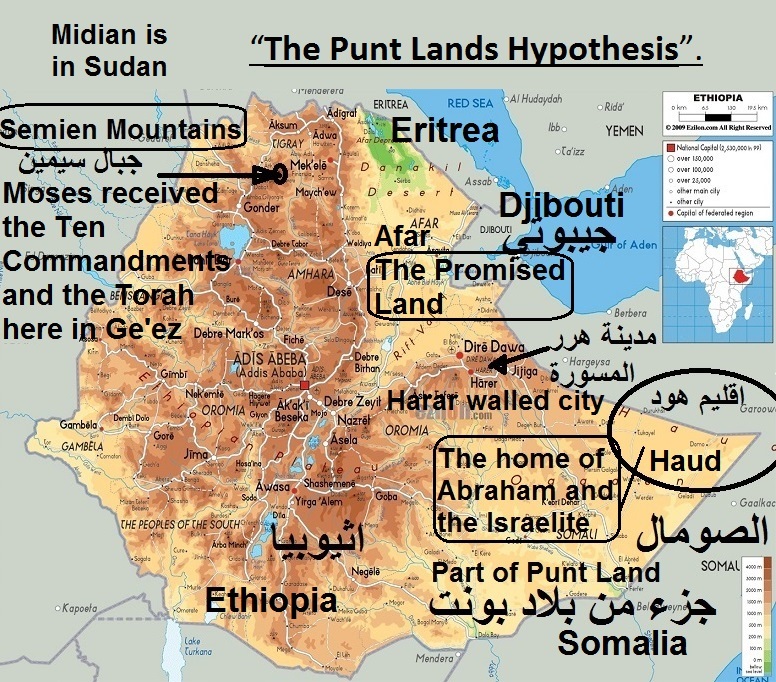 Midian was certainly in the very northern part of Punt in what it is today the land of Beja in modern Sudan. Unfortunately, since 1000 BC the Turkic Mongolians were very actively raiding and enslaving Arabia and the Horn of Africa. They created the Sabaeans bandits of Yemen, which was made as a forged version of Kingdom of Sheba. From that date the real history of Punt and genuine Israelite started disappearing. The Hyksos who colonized ancient Egypt “Kemet” during 1630 -1523 BC were driven out of Egypt and started the Mittani and other colonies which eventually destroyed Assyria and the whole Levant. Other Turkic Mongolian groups concurrently colonized the Indus Valley and north India; Iran; and Anatolia. In the lands of Punt they created D’mt as slavery and raiding colony. D’mt seriously destroyed Punt and was the gate to destabilize and then destroy Kerma in ancient Sudan, using slaves from Punt and the Israelite. Ancient Kerma was replaced by Kush which was a foreign creation targeting Egypt. Kemet lost its independence and started its downfall since 1077 BC by the end of the New Kingdom. The newly invented Turkic Mongolian Jews since 580 BC twisted the histories of Beta Israel and the whole of Punt and Sudan. But the Beta Israel still insist even inside the modern State of Israel that they are Israelite but not Jews at all. Another link to the real history of the descendants of Abraham is in the genetics of original Ishmaelite, who are wrongly considered as Arabs. Because of the jealousy of Sarah, Abraham had to abandon and exile his wife Hagar (which means in Ge’ez “country”) to what is known today as Makkah in Arabia. Hagar was a slave to the Israelite and probably from Tigray. Therefore the genuine first Ishmaelite were an admixture between genuine Israelite from Abraham and Tigray from Hagar. Then the Ishmaelite were gradually mixed with original Arabs from Makkah and with Arabized Turkic Mongolian raiders. The Times of Israel posted on 26 April 2016 “How a village left behind by Jews in Ethiopia became a top tourist draw”. Researchers need to team up to find out the Real Israel, Israelite, and the genuine scriptures and history. There is no good descriptions to those who deny the irrefutable evidences that Abraham, the Israelites, Moses, Jesus, and all other prophets and events mentioned in the Bible and the Quran were indeed 100% Africans. They are at least collaborators, traitors, ignorant or dishonest. The real and original Israel, Promised Land, Solomon’s Temple, and Jerusalem were all in the Afar Triangle. The present day “Israel” is actually an imitation started in 530 BC only. It should be called “Turkic Israel” or in short “Tisrael”.